Braude and Eagan already have a Twitter handle: @JimMargeryWGBH. In other post-WTKK news, afternoon drive-time host Michael Graham popped up this week on stations in Worcester, Concord, Plymouth and Southbridge. BOSTON, Mass. 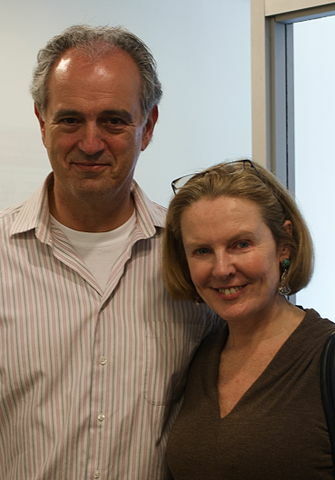 (February 6, 2013) – Jim Braude and Margery Eagan will serve as the new co-hosts of 89.7 WGBH’s Boston Public Radio beginning Monday, February 25. The format change is part of WGBH News’s ongoing evolution and continued commitment to strengthening the region’s most dynamic local news team. The live local program airs from 12-2pm each Monday through Friday on 89.7 WGBH. Braude and Eagan will lead two hours of local conversation that will continue to combine newsmaker interviews, conversation with experts, and listener call-ins. Callie Crossley and Emily Rooney, the awarding-winning veteran journalists who have led the consistent growth of Boston Public Radio, will continue to contribute to WGBH’s local, daily public radio talk show. WGBH and Boston Public Radio will also continue to include regular contributors Kara Miller, Jared Bowen, and Edgar B. Herwick III. As co-hosts of Boston Public Radio, Braude and Eagan will host a monthly Ask the Governor program on WGBH, a series they hosted in their former role at WTKK radio. 89.7 WGBH will make that monthly program available to any other Massachusetts station free of charge. WGBH will announce other major contributors and regular guests from politics, press, and culture in the coming weeks. For 13 years, Braude and Eagan co-hosted the Jim & Margery Show on WTKK 96.9FM. Braude, an Emmy-award winning journalist, started his career as a legal services lawyer in the South Bronx. Braude hosts Broadside: The News with Jim Braude weeknights on NECN. He founded and served as the first president of the National Organization of Legal Services Workers, a union representing staff in civil legal offices for the poor in 35 states. He published Otherwise, a magazine on American politics, and served as a Cambridge city councilor. Braude graduated from the University of Pennsylvania and New York University School of Law. “We are excited to join the WGBH News team and to be staying together as a team ourselves,” said Braude. Eagan, a columnist for the Boston Herald, grew up in Fall River, Mass. She is a graduate of Stanford University. Throughout her career, Eagan has written for a number of publications, including Boston Magazine. She has appeared on national and local news programs and is a regular guest on Greater Boston and Beat the Press on WGBH-TV. “I congratulate Jim and Margery on this next adventure and look forward to continuing our thoughtful conversations on how policy touches people in their everyday lives,” said Governor Patrick. Callie Crossley will continue to lend her signature perspective to the exploration of important topics, both local and national. Emily Rooney will provide a take on stories she is following for the WGBH-TV program Greater Boston. Kara Miller, who also hosts WGBH Radio’s Innovation Hub, will offer a window into the region’s most creative thinkers. Jared Bowen — Boston television’s only full-time arts journalist, a recently named Commonwealth Award winner and host of Open Studio, which premieres on WGBH 2 this Friday at 8:30pm — will continue to provide unique coverage of New England’s vibrant arts culture. Edgar Herwick, who developed the Web series One Guest, will continue to report on interesting and unusual topics that engage audiences. The re-formatted Boston Public Radio program reflects the continuing evolution of 89.7 and the growing WGBH News team, which draws significantly on the expertise of staff across radio, television and the Web. Today’s announcement comes on the heels of schedule changes that more prominently feature unique local programming throughout the week, including the new timeslot for Innovation Hub, hosted by Kara Miller, now at 10am on Saturdays. I am so happy to hear this news! If you click on the link, you;ll observe that I posted a comment to the MIACHAEL G-R-R-A-A-H-A-M story at All Access to the effect that this is probably not a typical hiring situation. Graham or his partners may actually be buying the time on this network of underachieving AM stations and then attempting to attract advertisers. If there are no suckers, um, takers, then Graham gets no paycheck. Good for them! I’ll be listening… GBH is filling the void for local talk! I think you are mistaken Mr. Glavin. If anyone knows Mr. Graham, they know he would never part with a dollar. There’s no way he is buying the time. Now, doing it for a very reduced rate (compared to his WTKK salary)….that’s another story! @Lou: Word around town is that @Laurence is right, although I haven’t seen any confirmation. The reason is mainly because the station he is now involved with typically deals with “sold programs”, infomercials, and the like. Is Michael Graham buying the time? I seriously doubt it. Is *someone* paying? No doubt! In typical radio, the commercials pay for the time. Is there someone footing the bill? Could there be a sugar daddy somewhere that is putting up the dough? Is someone (maybe a car dealership or the like) sponsoring the entire program? More likely. Again, knowing Michael Graham…I seriously doubt he is buying the time. What is more likely is that he is doing it for small money, just to stay on the air and and visible. On the “pay for play” thread… does anyone know if the Andelmans where paying for their time doing the Pahntom Gourmet WTKK show and then selling their own ads? Also, when they would appear on Eagan & Braude, it was always for self promotion! I wonder if those where paid spots too…. @Jeff: I don’t know. I do want to point out that such arrangements can be pretty lucrative. Pat Whitley made a fortune by owning his own restaurant show and selling the ads himself. Not a regular listener, but Braude and Eagan are class acts with a solid, informative show refreshingly rancor-free. Glad they’re back on the radio dial.